Technology companies gearing up for a new product launches know full well they’re adding to a crowded marketplace. It can be particularly challenging for B2B startups offering SaaS or other tech services to generate visibility when the category isn’t new. But no tech company can afford to overlook the power of public relations to create anticipation, credibility, and impact for a new offering. For the company, a new product launch is the biggest news in the world. How can they make it big to the people who matter? Increasingly, reporters in the tech, advertising and marketing space are less inclined to do traditional product launch coverage unless the company is a top gun. The media tend to focus on Facebook, Salesforce, and Amazon, among others. 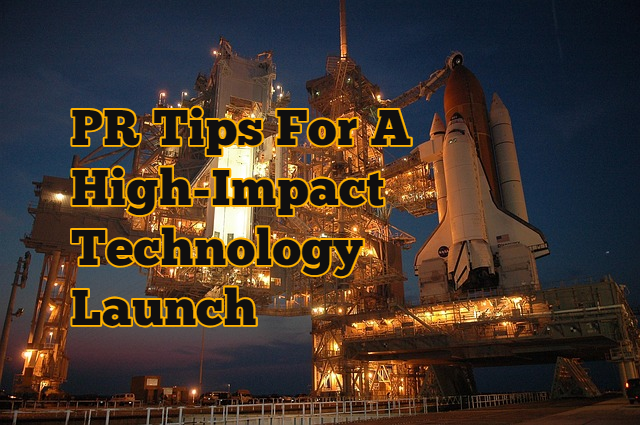 To be successful, tech PR pros need to tap into a broader, buzzed-about trend to make the product launch meaningful and timely. Why is the product or service needed? What pain points does it address? For example, a startup with a new software that detects manipulated images through machine learning can join the conversation about fake news stories, the growth of AI, or information security advances. And if you can tie your offering to one of the giants like Apple or Facebook, that helps, too. If you’re not Adobe or Salesforce, driving embargoed coverage for a product launch can be difficult. Smaller companies and non-unicorn startups can consider providing a single media outlet with an “exclusive” on the announcement, meaning that they get the story first. Though there’s no guarantee, exclusive access makes the time and resources spent on the story more worthwhile for the outlet in question. An entire media sector may lack an incentive to cover a smaller company’s product under embargo unless the launch is massively interesting or the category is new. In some cases it’s better to drive one great story for a new product versus attempting to generate several and coming up empty handed. For more detail about the art of offering media exclusives, see this post about how to apply it in tech PR. In the B2B world, product launches can get a big boost when a customer or beta user is on board to be spotlighted. Reporters will take even more interest if the client is a pilot partner, and the company has success metrics or positive reviews to share at launch. Partnering with a bigger brand in a non-competitive sector can be fruitful for a launch, since the smaller company can ride on its reputation coattails. Of course, strategic partnerships must be mutually beneficial, with the kind of “win-win” outcomes neither company could have gotten on its own. But a customer-driven launch can swiftly ramp up the news value of the announcement. Another key element that drives news value is an influencer strategy. Journalists often like to speak to sector experts, either on or off the record, to understand the potential impact of a new product or service. If a company is launching its new product at its own event or at a trade conference, the influential community members can play a role in shining a spotlight on the event before a captive audience. If the product is truly worthy, industry experts will be delighted to create the buzz. Plus, if they’re involved at an early stage, top influencers can offer actionable feedback. And if there’s a visual aspect, as in the consumer sector, top business users can be tapped to create shareable videos. But keep them short – chances are that you have a mere few seconds to make an impact. For a product launch, it’s tempting to slip into a commercial mindset that stresses features over function. But in most cases it makes more sense to build coverage by focusing on the bigger picture. The media approach and press materials should talk about the problem that it solves, generating data to make the case. Or the PR strategy may be to tell a story about the motives of the creators, or the obstacles they overcame. That’s likely to be more memorable than acronym-laden features or jargon about how groundbreaking the launch is. We’re big believers in early preparation for any kind of product launch campaign. First, there’s the content factor. Note that any PR or content team needs to build in time to create compelling blog posts, bylines, and videos – all of which incidentally build SEO to support the launch. Media exclusives can only be offered to one reporter at a time, and we can wait days for a decision, especially during busy seasons. Above all, a product or service launch isn’t a one-day event. Once launch coverage is secured, the story can be told more fully over time – through customer success, market impact, education events, and longer-term influencer programs – and the successful PR has only just begun.